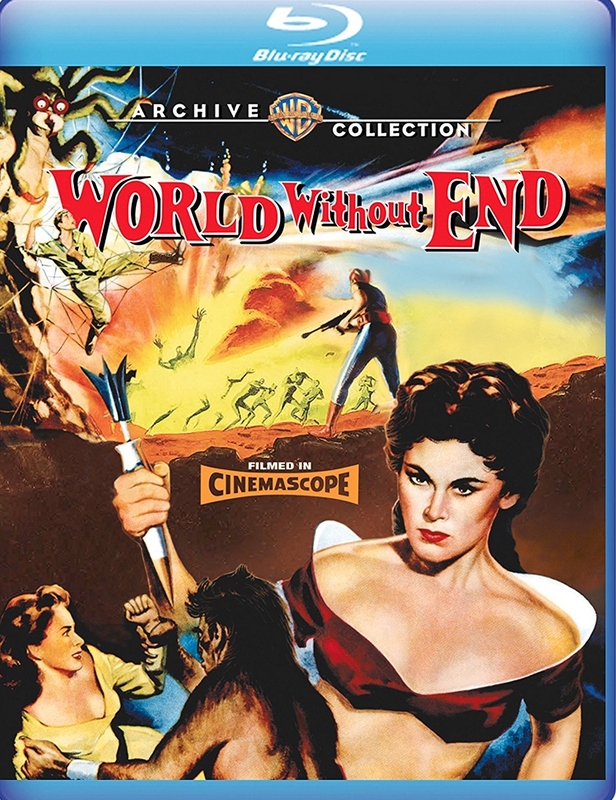 World Without End, said to be the first 1950s sci-fi film to be presented in CinemaScope, is an above-average example of the genre and has been beautifully brought to Blu-ray by the Warner Archive. 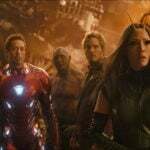 Plot: Astronauts returning from a voyage to Mars are caught in a time warp and are propelled into a post-Apocalyptic Earth populated by mutants. Run Time: 1 Hr. 20 Min. 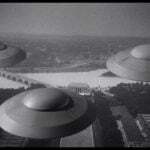 In 1957 a manned space mission to orbit Mars has lost radio contact with Earth. The crew of the spaceship, however, is unperturbed by this development, blaming the problem on magnetic interference in the atmosphere of the red planet. 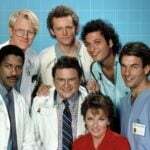 The crew consists of the ship’s captain, John Borden (Hugh Marlowe); Dr. Eldon Galbraithe (Nelson Leigh), the mission’s scientist; radio operator Herbert Ellis (Rod Taylor); and navigator Hank Jaffe (Christopher Dark), the crew’s only married man. 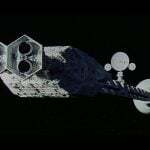 Upon completion of the mission the spaceship heads back to Earth, but it unexpectedly enters a time warp and speeds up uncontrollably, causing everyone aboard to black out. The spaceship then crash lands in a snow-covered mountainous area, remarkably causing little damage and no injuries. The members of the crew have no idea where they have landed, but their instruments show that the atmosphere is similar to Earth’s and they can breathe without difficulty. They decide to hike down below the snow line and explore the area. Following an encounter with giant spiders, they bed down for the night and are attacked by mutant cavemen. When they come across an old cemetery and find tombstones for people who died in the year 2188, they realize that they are actually on Earth. Dr. Galbraithe explains that the spaceship reached such incredible speeds that they must have broken the time barrier, landing themselves hundreds of years in the future. After surviving another attack by mutants, they take refuge in a cave which leads to an underground city occupied by humans who speak English. The men receive a friendly greeting from Timmek (Everett Glass), the head of the Council. The subterranean men dress in colorful outfits and for some reason wear skull caps. Timmek explains that the current year is 2508, and centuries earlier most of mankind was wiped out in an atomic Armageddon which poisoned the air, water and soil. The survivors who remained on the Earth’s surface turned into cavemen-like mutants, but some escaped that fate and avoided the radiation by living underground. The Council members are sympathetic to the crew’s plight, the sole exception being Mories (Booth Coleman, bearing a strong resemblance to Larry Hagman), who is suspicious and insists that the astronauts not be allowed to keep their weapons. The members of the crew are then introduced to the beautiful Garnet (Nancy Gates), who is Timmek’s daughter. She arranges for the four men to have food and quarters. She then introduces them to the assistant in the scientific section, Elaine (Shirley Patterson, billed here as Shawn Smith), who immediately takes a liking to Herb Ellis. It seems that the men of this underground world have grown timid and weak after centuries of no exposure to the sun, and the women are attracted to the rugged 20th-century explorers. When Elaine sees the shirtless Herb she takes a good look and exclaims, “My, you are so much more muscular than our men.” At the same time sparks start to fly between Garnet and John Borden, much to the dismay of Mories, who wants Garnet for himself. He then plots to discredit the astronauts, who are only looking for assistance to repair their spaceship. The capable cast is led by Hugh Marlowe (Twelve O’Clock High, The Day the Earth Stood Still), who is authoritative as the military leader of the fateful mission. This is one of Rod Taylor’s early film appearances and his Australian accent is noticeable (he of course starred in a somewhat similar film, The Time Machine, several years later). Nancy Gates is very appealing as Garnet, and all of the female characters are decked out in skimpy (for 1956) costumes designed by the pin-up artist Alberto Vargas. The specter of nuclear war was a staple of science fiction films in the fifties. An Allied Artists production, World Without End wants to be a cautionary tale, but it falls short in part because it gives no insight into why or how the cataclysmic war started. Written and directed by Edward Bernds, (Return of the Fly, Queen of Outer Space), the film loses momentum in the middle during the somewhat claustrophobic scenes in the underground city. Even so, the special effects are surprisingly good, the women are beautiful, and the mutants look and sound ferocious. Fans of the genre are certain to enjoy this Blu-ray release. The 2.35:1 CinemaScope and Technicolor image is delivered in 1080p via the AVC codec. The exteriors were filmed on location at the Iverson Movie Ranch in Chatsworth, California and the iconic rock formations will be easily recognized by film buffs. The picture is very sharp and clean, with no scratches, dirt, or other anomalies to interfere with one’s viewing pleasure. Colors are vivid and accurate, black levels and shadow detail are fine, and a natural level of film grain has been retained. Readers who enjoy visiting filming locations are encouraged to check out this Iverson Film Ranch website, where you will find numerous “then and now” location shots from films going back to the silent era. Bear in mind that you may find it difficult to tear yourself away. The English 2.0 DTS HD-MA mono audio is clean and clear. Every word of dialogue is understandable and the music by Leith Stevens has excellent fidelity. 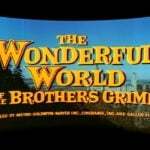 Bob Furmanek has confirmed that World Without End also was released in Perspecta stereo, which as I understand it was not real stereo. English SDH subtitles are available. There are no extras on this bare-bones release. It also is devoid of chapters per se, although you can advance through the film using the skip button on your remote. World Without End is not great sci-fi, and it is not nearly as good as the far superior The Time Machine, but is has an attractive cast, excellent on-location cinematography, and is more intelligent and enjoyable than many films of the genre. Readers who are interested in purchasing it can find it at the Warner Archive website or at Amazon. I’m looking forward to watching this on my projector later this week. Mine should be here tomorrow…can't wait! I just finished watching the movie and I have the following impressions: 1) That was some awful spider and that’s not a compliment; 2) The film looks great. All films from the 50’s should look so good; 3) The method of time travel actually has a firm scientific basis. However, had they really gone that fast I think they would have shot out of our solar system in no time (pun intended) at all; 4) I appreciate that they didn’t use some hokey plot device to return to their own time; 5) It’s an enjoyable, above average B movies from the 50’s. While the time travelers didn’t get to return to their time, and even one of the crew experiences a personal tragedy via time travel, the ending is optimistic. Watched the blu-ray today and my thoughts concur with Johnny. Definitely need Queen of Outer Space next. Thanks for the review, Rich! You sold me, just purchased it on Amazon for $10.23.